CryptoLocker 5.1 ransomware uses sophisticated techniques to infiltrate computers and hide from its victims. Use Reimage to determine whether your system is infected and prevent the loss of your files. CryptoLocker 5.1 virus pretends to be a member of CryptoLocker family by borrowing the well-known virus’ name and file extension. The new file-encrypting virus does not differ from other ransomware viruses; it operates and spreads similarly. When the victim opens an infected email attachment, the virus gets inside and starts encoding lots of different types of files located on the computer. It uses strong RSA-2048 algorithm and appends .locked file extension. When data encryption is over, victims cannot open any of their documents. According to the crooks, corrupted files will remain damaged forever, if victims do not pay the ransom within 48 hours. Cyber criminals beware that computer users are scared of losing their important files, and only a few of them make backup copies regularly. For this reason, many users are willing to pay a huge sum of money for the possibility to recover lost files. 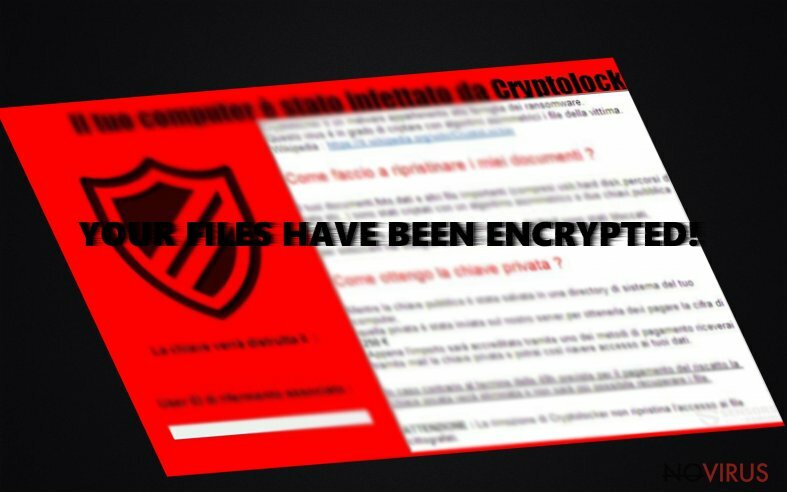 If you became a victim of CryptoLocker 5.1 ransomware, we advise you not to pay the money. Chances that they give you a necessary decryption key are small. 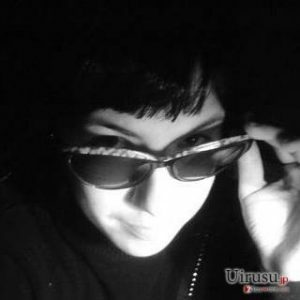 Usually, hackers disappear after receiving the money, because the primary goal of the ransomware is to swindle money from the computer users. Instead of risking your money, you should remove CryptoLocker 5.1 from your system. Virus elimination does not recover lost files, but after removal, you will be able to use additional methods to decrypt at least some of your data. It seems that CryptoLocker 5.1 virus targets Italians mostly because it leaves a ransom note in the Italian language. Once ransomware completes file encryption process, it drops a ransom note called LEGGI.txt and delivers a pop-up window which includes unique ID, timer, and important information about data encryption and decryption. In the pop-up window, hackers explain victims that all their files were encoded and they can get them back only if they pay the ransom. They have to pay €130-250 in two days and contact criminals via provided email address: cryptolocker51@sigaint.org. Within day or two hackers respond with a necessary decryption key. Victims have to hurry up and make the decision quickly because when the time runs out, file decryption key will be deleted and the possibility to recover lost data will be gone forever. Indeed, at the moment there are no free decryption tools available, but we do not recommend paying the ransom. Scan your computer with Reimage, Malwarebytes MalwarebytesCombo Cleaner or other anti-malware program and initiate CryptoLocker 5.1 removal. As we already mentioned, hackers might disappear after receiving the money, but the virus stays. Malware makes your computer vulnerable and might let other computer infections get inside. Therefore, it’s important to remove the virus and later think about data recovery. CryptoLocker 5.1 ransomware spreads via malicious email attachments. Cyber criminals launch various persuasive spam email campaigns and trick users to open the attached PDF file. They find numerous reasons to trick users that the document is safe and important. Usually, an infected file is named as invoice, receipt or financial report. It’s hard to believe that bank, financial institution, governmental organisation or other reputable company might send a virus. Unfortunately, nowadays computer users have to doubt everything they see and receive online. Any link, advertisement or email attachment might include CryptoLocker 5.1 malware or another file-encrypting virus. Before opening any email attachment from the unknown sender, double check the information. Hackers might copy even the design of an official website, so you can never be sure if you can trust the sender. Ransomware is one of the most hazardous computer infections, so their elimination should be held using powerful and professional tools. For CryptoLocker 5.1 removal we recommend using one of these malware elimination programs: Reimage, Malwarebytes MalwarebytesCombo Cleaner or Plumbytes Anti-MalwareMalwarebytes Malwarebytes. It’s only our recommendation; you can always choose other reputable tools. However, the virus might block access to an antivirus program, prevent from scanning computer’s system or installing a new program. Then, you have to reboot the computer to the Safe Mode with Networking and remove CryptoLocker 5.1 by following our instructions bellow. Sign in to your account and launch any Internet browser. Download a legitimate anti-malware software, for instance, Reimage. Make sure you update it to the latest version and then run a full system scan with it to detect and eliminate all malicious components of the ransomware to remove CryptoLocker 5.1 completely. In a new window that shows up, click the Next button and choose a restore point that was created before the infiltration of CryptoLocker 5.1 and then click on the Next button again. After restoring the computer system to an antecedent date, install and check your computer with Reimage to uncover any remains of CryptoLocker 5.1. Using the tutorial provided above you should be able to eliminate CryptoLocker 5.1 from the infected device. novirus.uk team has also prepared an in-depth data recovery guide which you will also find above. Virus researchers haven’t manage to crack the code of CryptoLocker 5.1 virus and create a free decryption tool. However, after ransomware attack, you might recover your files from the backup copies. If you have never backed up your files, you have probably learnt your lesson now. Under these circumstances, you can try three additional methods to retrieve lost files. We cannot assure that they will decrypt your files, but we believe you should give them a try. Data Recovery Pro tool might be useful to decrypt files after CryptoLocker 5.1 attack. The application was created for locating and restoring missing and corrupted files. If you have enabled System Restore function before ransomware attack, follow the steps bellow and try to recover your files. If the CryptoLocker 5.1 haven’t deleted Volume Shadow Copies, you might restore some of your files using Shadow Explorer. Follow the steps bellow. It is strongly recommended to take precautions and secure your computer from malware attacks. To protect your PC from CryptoLocker 5.1 and other dangerous viruses, you should install and keep a powerful malware removal tool, for instance, Reimage, Malwarebytes MalwarebytesCombo Cleaner or Plumbytes Anti-MalwareMalwarebytes Malwarebytes. This post was published on 2016-10-24 at 11:15. Category: Ransomware, Viruses. You can quickly scan the QR code with your mobile device and have CryptoLocker 5.1 ransomware virus manual removal instructions right in your pocket. What method did you use to remove CryptoLocker 5.1 virus? Cannot remove CryptoLocker 5.1 virus?